Jonathan: Although Carrie does most of the reading in the family, occasionally I'm drawn to a particular title and am able to devote a few hours to a good book. 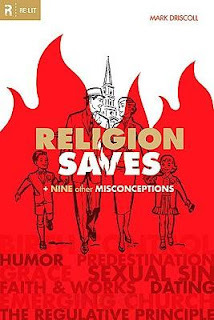 Such was the case for Religion Saves : And Nine Other Misconceptions by Mark Driscoll. We'd heard of Mark Driscoll before, as the pastor of Mars Hill Church in Seattle, with a particularly bold leadership style that has attracted a large following. Carrie: I have to say that this book made me nervous because I was confusing Driscoll's Mars Hill Church with Rob Bell's Mars Hill Church. They are not affiliated with one another. Bell is part of the emergent church movement. Mark Driscoll stands opposed to it. Once I understood that fact, reading this book was not a problem. Jonathan: The fundamental concept behind this book caught my attention immediately. Driscoll set out to discover the most controversial questions facing the current generation of Christians, with the intention of writing a book to address those specific issues directly from scripture. Picking up the book, I opened it immediately to the chapters I was most interested in. (Don't worry, Carrie, "Dating" was not one of them!) I think that's the way this book is intended to be used -- jump to whatever subject most applies to your life and thoughts at any given time, don't try to digest it from start to finish reading in one large chunk. Carrie: I read three of the chapters in this book. First, I read the chapter surrounding questions involving the concept of the Emerging Church. I appreciated the way that Driscoll laid out his explanations for the various church movements, pointing out the differences between the reformed vs. liberals. I thought he did a really good job laying out the perspectives and it helped me make sense of things and understand who some of the key players are and where they are coming from. Secondly, I read the chapter on Birth Control (and was offended by about half of its content because I thought it was more explicit than it had need to be) and lastly I read the chapter on Biblical Humor and really can't say that I think much of Driscoll's method of communication. Basically - he thinks he's funny and I don't. He likes to reference Doug Wilson. A lot. But I walked away feeling like he was using Wilson as an excuse to attempt his variety of humor, and it wasn't backed up by anything really solid in the scripture department, and therefore I was less than impressed. Jonathan: In my reading of this book, I found that, in general, my theology agrees solidly with Driscoll's arguments. His theology is practical and down-to-earth reformed doctrine, without much sugar-coating. His writing style is conversational, yet at the same time very studied, like listening to an engaging lecture series by a seminar professor on "Apply Christian Doctrine To Our Lives And Culture". Carrie: I agree with Jonathan in saying that my theology tends to agree with Driscoll's. He just communicates in such a way that really grates on my nerves and makes it hard(er) for me to admit to the fact. As Jonathan said, his writing style is conversational which also makes it controversial. That said, I'm willing to extend some grace here because I really like Doug Wilson and, having sat under his teaching for almost a year when I lived in Idaho, I can "hear" him talking in his writing. I have seen how Wilson can be misquoted and misunderstood, because the way that he communicates is risky. However, "knowing" him helps. I don't know Driscoll which makes reading him somewhat problematic. I've never heard him speak. And so I read what he has written here and I have to grit my teeth and try to catch the gist of the message and assume his attitude. When the smoke stops pouring out of my ears long enough, and I go back and re-read paragraphs, I find that I typically agree with him. Jonathan: Driscoll's responses to each of the questions in this book are pretty thorough, but they stop short of becoming tiresome. They are extremely rooted in scripture (very much appreciated!) and he includes as much foundational doctrine as is necessary to address each issue, without going overboard or off on tangents. His approach of teaching directly to the controversial questions being asked by people is similar to the book of 1 Corinthians, where Paul answers a series of questions posed by people in the Corinthian church. I admit I laughed out loud at that. Jonathan: Overall, my opinion is that Driscoll did a good job addressing important questions in a broad spectrum of topics. At the same time, the "9 misconceptions" described by the title are not really addressing misconceptions at all, but just applying the truth of scripture to some important areas of life. Carrie: I do like the premise of Religion Saves and I do like how much it really makes you grapple with your beliefs. I think he laid out his thoughts and his arguments well. I just have a hard time with his communication style, though, and that makes it something of a struggle for me to deal with. In conclusion - we talked about this book again after we wrote up this review and we both agreed that Driscoll's communication style makes it hard to hear his message at first. Definitely don't plan on reading just one chapter to get a feel for who Driscoll is and expect to think you have him all figured out. He's complex, which, in this case, is a compliment! For what it's worth - them's our thoughts! I loved this review, you two should do this more often! I enjoyed the back and forth thoughts and opinions. This sounds like a good book for gaining more knowledge about the emergent movement and possibly expanding one's views/ideas about other common problems today's Christian's talk about. Sky - Jonathan here, that sounds great! I'll get right to work on my next post... "Anne Of Green Gables: A Dissenting Opinion"
I saw Driscoll on YouTube last year and I was completely turned off. So when I saw this book, I didn't look at it twice. I guess maybe I'll give him one more try. Maybe reading him is a littler easier than watching him. But, like you, I will probably still be a little put off by his style. Thanks for the review! You are a great tag team. Interesting way to do a review! I don't have all my current well-known pastors/leaders straight, so I had to search a little to see if this is the guy I was thinking of, a pastor known for being crude and profane, and apparently he is. I think I'd prefer to get my spiritual food somewhere else, but I appreciate that you bring out the good as well as the bad. Sounds like a good exercise in discernment! Don't much care for Driscoll's communication methods either. Love the Jonathan + Carrie comment on a dissenting opinion--now, THAT'S funny! I'll definitely be reading this one. While we don't agree with everything he says (inevitably), Mark Driscoll has been a tremendous blessing in our lives. Thanks for the review(s). Hmmm...very interesting. Thanks so much for this review. Knowing both of you...I can so see everything you said played out in real life! : ) Great review ya'll! This sounds like an intriguing book. Thanks for bringing it to my attention. Loved reading this book discussion! Such a great way to write it up. I really like the format of this (to agree with all your other followers) and I agree with you on Mark Driscoll. I've listened to some of his sermons on podcast and sometimes his tone(?) language(?) manner(?) I don't even know what to call it, turns me off. BUT he's solid. And he loves the Lord. And he's not unwilling to admit to being too mouthy.